With sophisticated models and scalable compute, Artificial Intelligence becomes a realistic tool for data analysts. Power BI helps you get insights from your data. Now, with access to a set of models from Azure Cognitive Services and your custom models in Azure ML, you can easily enrich those insights with AI. Cognitive services in Power BI gives you access to an expanding set of algorithms for analyzing text and images without writing custom queries or connecting to APIs. If you’re a data scientist, business users can easily apply the Azure ML models you’ve shared with them on new data in Power BI. The preview release of cognitive services and Azure ML in Power BI allows you to enrich data in Power BI dataflows. Simply pick from your personal library of models to score the sentiment of text fields, tag images, or apply a custom model from Azure ML. Cognitive services functions require Power BI Premium capacity to run on. Azure Cognitive Services brings together a set of powerful, pretrained models for intelligent applications. Today, we’re exposing four models in Power BI: language detection, sentiment scoring, key phrase extraction, and image tagging. These models can be used on textual data or images. Say, for example, you have a collection of customer reviews for your international business. 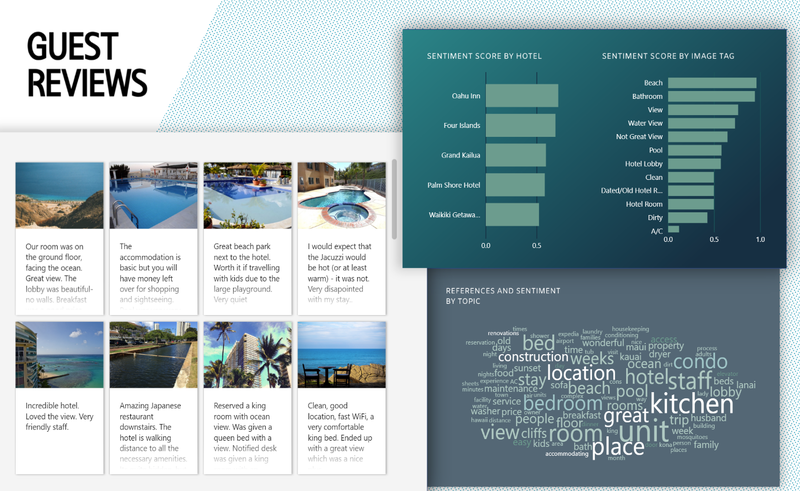 In Power BI, you can analyze the overall sentiment, compare sentiment between reviews in different languages, and find topics that are related to high or low sentiment scores. For reviews that include pictures, you can find tags associated with positive or negative reviews. 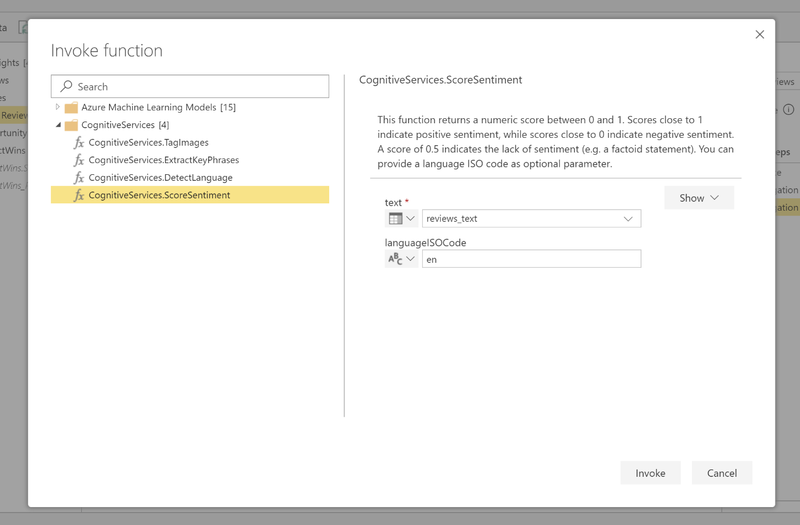 Cognitive services are accessible through the AI Insights browser in Power Query Online. 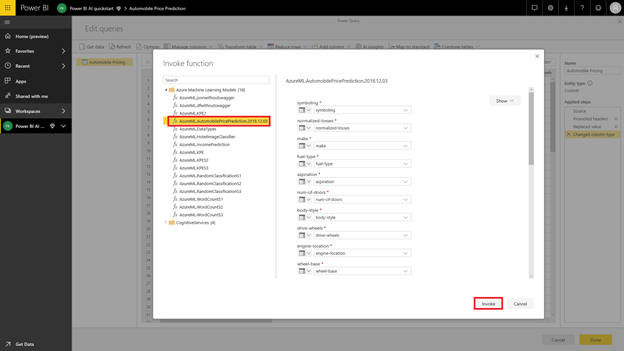 Power Query Online is your editor for dataflows in the Power BI service. To score the sentiment of the review in the previous example, I select the score sentiment function. In the text parameter, I just select the column to score. Optionally, I can provide the language the text is in. Many organizations use machine learning models for better insights and predictions related to their business. Building a machine learning model can require significant effort and specialized skills. A machine learning model is more valuable when business users have the ability to visualize and use the insights from the model. Power BI users can now easily access insights from Azure Machine Learning models, when data scientists share access to their models in the Azure Portal. As a Power BI user, I can automatically see all the Azure ML models that have been shared with me in the AI Insights browser in the Power Query Online editor. I can simply select the model, and Power BI automatically maps columns from my data with the parameters of the model when the name and data type matches. I can apply the model to my query, and the score from the ML model is added as a new column in my dataflow. Feedback or suggestions? Submit your idea on AI and Machine Learning in UserVoice, or place a comment below.